Follow these steps. It’s simple. 1. Pick a sunny location , free of grass (or “free it” from the grass! ): Some veggies can tolerate shade; be sure to ready the care label. 2. In-Ground or Raised Bed – Decide whether you will be planting in the ground or in a raised bed. Obviously, if you pick the raised bed, there will be additional preparation if the boxes haven’t been made yet. 3. Soil Preparation: Determine whether your soil is predominantly sand or clay. If you are lucky, it will be a nice loam, but don’t count on that. Chances are, your soil isn’t a loam. You will want to supplement the native soil with a composting product together with a good planting mix. Roto-till or good old-fashioned shovel in these amendments and level out the soil. More about soil prep. 4. Design for Access and Convenience – Depending on the size of your vegetable garden, you will need to consider how to access it for feeding, weeding, and harvesting. Perhaps it is narrow (up to 3 feet), in which case you can reach from the garden bed edge without a problem for these chores. If your garden is wider than this, plan a way to access your plants without trampling them and compacting your soil around the plants. This may mean a stepping stone path through the middle, or small paths to otherwise unreachable plants. 5. Plant Selection – Plant selection ties into #6 below. Presumably you’ve already got an idea of what you want to grow. Think about your vegetable garden’s ultimate size, shape and support needs when designing plant placement. Does your selection need a support structure? Tall plants should be placed more toward the back of your garden, so they don’t shade your smaller/shorter vegetables and herbs. Carefully consider the ultimate plant size for space considerations. They are little when planting, but some veggies get very large. They’ll need the space and airflow. Here’s a vegetable planting guide. 7. Fertilize – You have choices here: regular chemical fertilizer (liquid or slow-release) or organic fertilizer. 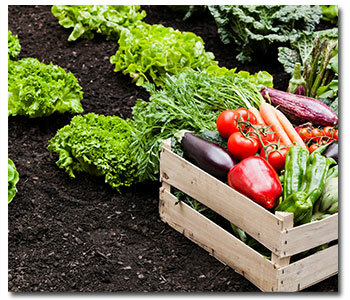 Remember when choosing fertilizers that you are ultimately planning to eat these vegetables. 8. Pest Management – get your pinching fingers ready, or your garden hose: Again, remember that you plan to eat these vegetables, so your choices on pest control are limited. Also, you need insect pollinators for fruit/vegetable production, so bees and other pollinators are important for your vegetable garden. If you must spray the pest insects, a year-round spray oil is a safe remedy. You should pick a time of day with minimal bee activity and carefully follow the product instructions. 9. Mulch, Mulch, Mulch – for weed control and good moisture retention: Throughout the growing season, water and periodically fertilize; keep weeds down to eliminate plant space competition. Have fun watching your vegetables and herbs grow. If you do grow any vegetables from the legume family, such as green beans, these plants add nitrogen back to the soil. What a plus! At the end of the season, instead of ripping the plants up, roots and all, leave the roots behind. It’s good for your soil!